For thousands of years, people have been using dogs to contribute to human culture. As far back as the 10th century, dogs were used for hunting and traveling. In regards to the latter, dog sleds have been a prominent part of civilization for many years, and remain so to this day, although for distinctly different purposes. Whilst remaining a necessary form of travel for some, dog sledding in most of today’s current societies is more commonly reserved for sport and recreation. Dogs involved in sledding are categorized depending on their designated position when pulling the sled. 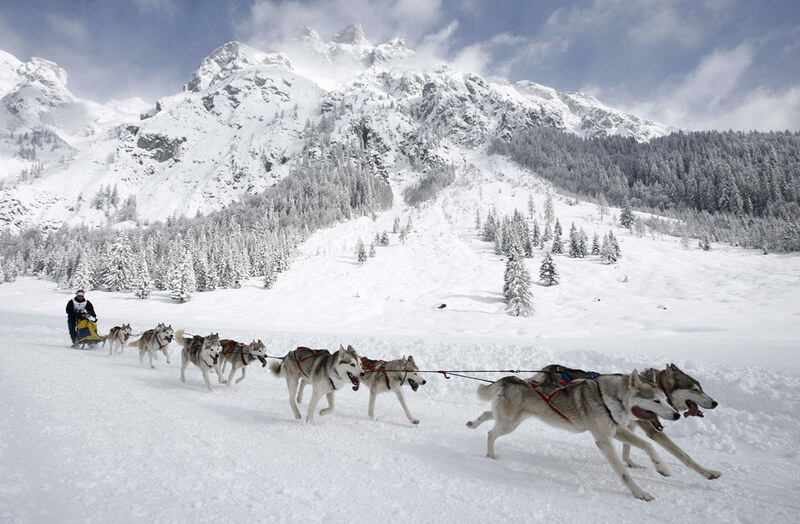 For example, the dog or dogs at the front are specifically trained to lead, while those directly in front of the sled, wheel dogs, are required to be stronger as to pull the sled from deep snow. Due to their speed, strength, endurance and natural determination, Huskies are the dogs of choice for the majority of sledding mushers; starting them off early, pulling logs to train as early as six months old. For anyone enticed by the prospect of befriending some lovable pups and venturing out into the wilderness for a scenic and exceptionally rewarding experience, you’ll find a copious amount of options both home and abroad. Below we list just a few of the destinations available to those seeking a polar adventure. Make sure to note down your favorite places in your BUCKiTDREAM planner, and don’t forget to bring a sweater! If it’s a homegrown sledding vacation you’re after, then the Wintergreen Dogsled Lodge (considered the ‘sled dog capital of the US’), should be at the top of your list. For more than 35 years, the fine folks over in Ely, Minnesota, have been providing lodge-to-lodge sledding for thousands of satisfied visitors. Ely is known for its stunning scenery, a gateway to a wonderland waiting to be explored by you and your soon-to-be canine companions. Furthermore, Wintergreen demonstrates expertise through their sole focus on dog sledding; boasting the only lodge operation in the country devoted exclusively to it. Due to their comprehensive know-how, Wintergreen specializes in offering sledding opportunities for the experienced, as well as beginners (no matter what your physical fitness), over a four-night stay. For those seeking an extra challenge, you can become completely immersed within nature by passing up the log cabin and camping outdoors – although this will require some degree of physical capability. Accompanying you on this epic escapade will be a host of the 65 purebred Canadian Eskimo dogs that Wintergreen is proud to call their own. Canadian Eskimos are used because of the little training required due to their strong instincts. The surrounding area encompassing Wintergreen is considered one of the ‘Top 50 Must-See Destinations’ by National Geographic. This outdoor quality is matched by the services, accommodations, and equipment supplied by Wintergreen. Not only do they design, produce and provide their own high-end winter clothing, but their lodges come equipped with private rooms, saunas, excellent food, as well as additional trails for skiing and snowshoeing – not to mention tailor-made stays for each individual. Training is included, as is a guide who will plan the days based on your interests. This family-run business offers a range of tours at a reasonable price and is ideal for beginners as well as the whole family. With over 200 miles of trails to journey down, an annual snowfall of almost 500 inches, and a six-month long season, dog sledding comes naturally here. Yellowstone prides itself on appealing to people of all ages, which is why they offer two distinct packages for any potential customers. First is the ‘Sled Dog Sampler’, which is a short, one-hour activity, aimed at providing an authentic sledding experience, while not requiring any mushing responsibility from its visitors (who just might get a taste for it in the process). The second package is much longer and more hands-on. ‘Learn to Mush’ comprises of a one-to-two day experience where the guests are able to pilot their own dog sled – after being trained by a guide of course. This voyage is suited for anyone over the age of 5, and both trips set sail near the Big Sky Resort and West Yellowstone. While not providing any on-site accommodation, Yellowstone is partnered with both Big Sky Resort and the all-inclusive Lone Mountain Ranch, if you’ve decided to stay for multiple days. Not only that but upon meeting your guide at the Rainbow Ranch Lodge, you’ll be treated to a delicious complimentary breakfast and a selection of seasonal drinks. Due to the start of the trails being off-site from any lodging, driving to the meeting point is required. Yet while Yellowstone may lack the lodge-to-lodge appeal of other services, such as Wintergreen, their more casual approach to dog sledding makes the activity approachable by adults and children alike. And as they know that families will want to capture memories of their snowy adventure, every guide will make sure to periodically stop and give ample photo opportunities, maybe even with an unexpected animal photobomb – Montana is one of the most wildlife-rich states in the country, after all. For those wanting to spread their wings a little further, The Husky Mountain Expedition in Sweden comprises some of the most beautiful landscapes and challenging terrain available for any keen dog sledders. Fly to the town of Kiruna in far north Swedish Lapland, and discover the frozen river of Torneträsk, the lakeside tranquility of Abisko, and the imposing grandeur up Kebnekaise Mountain – Sweden’s highest peak. As you spend eight days touring the jaw-dropping vistas, staying in exquisite log cabins with their own wood-fired saunas, your journey will take you along the world-famous King’s Trail. Delicious Swedish cuisine is included, fueling your unforgettable endeavor. Accessible to anyone with good health, The Husky Mountain Expedition is strongly advised to be attempted only by those with a high level of physical fitness. This is especially relevant when upgrading your retreat to either the 12 or 14-day packages. Your tour will be made possible by your own team of four Siberian Huskies pulling you into the idyllic wilderness. Before setting off for this expedition of a lifetime, you will meet with your personal guide, be provided with the appropriate clothing and equipment, and shown the ropes of commanding your own sled. Exploring the outside area and the bordering forest is also available on the day of arrival. Setting off from Kiruna, you will be driven to the village of Abisko, where your trip truly begins. From there you will be eased into your journey with roughly eight miles of cross-country sledding. The following days will not be quite so relaxed, with sledding distances covering anywhere between 15 and 22 miles each day. Every day is assured to have its own individual charm and character, however; just picture the majestic sights swooping by, urging you through trials and tribulations, all the while being immersed in a unique and diverse landscape. A recommended detour is to the world-famous Ice Hotel in Jukkasjärvi, a mere 15 minutes away from the kennels. And if that wasn’t enough to convince you, here’s the cherry on top of this captivating cake: due to the remote nature of your locale and its lack of light pollution, the glorious Northern Lights are often on display for your viewing pleasure (typically around early April). There has never been a better time to try something new; so how about packing up some earmuffs and starting on those plans in your BUCKiTDREAM planner today. Don’t forget to share your experiences on Facebook, Twitter and Instagram.